A call Charles Ehrardt at Camper & Nicholsons confirms that he's closed on the sale of his central listing, the 37.14m sailing yacht Marflow. Marflow was built in 1982 by Shore Boats in Canada as Ora to a William Garden design and established a reputation as a world-girdling expedition yacht. 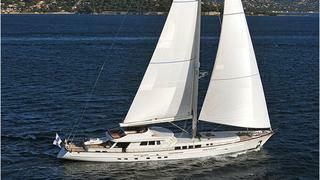 In 2006, her new owner took her to Dutch Yacht Builders for a total rebuild. Lloyd’s classed, every element of this superyacht was renewed, and even the hull was massively upgraded and redesigned by Pieter Beeldsnijder. Her light mahogany interior has exceptional headroom, and she accommodates up to eight guests in a master stateroom with a king size bed, two queen size berth staterooms and a twin cabin with a Pullman berth - all with en suite bathrooms. Marflow is fitted with twin 450hp Caterpillar engines delivering a cruising speed of 10 knots under power.